Baranof Wilderness Lodge, Alaska | Tailwaters Fly Fishing Co. Guests travel to Sitka, Alaska (SIT) on Sunday and overnight before flying to the lodge Monday morning to start the first full day of fishing or other activity. Sitka is easily reached in one day from most of the continental U.S. with a stop in Seattle. The lodge’s conventional gear program is geared towards trolling for salmon, rockfish, and dredging for huge halibut in the fertile waters of the Inside Passage. Fly fishermen particularly enjoy the freshwater fishing opportunities on small, steep, rivers that dump into the tidal estuary. These pools at the outlets of countless of these little rivers and creeks are loaded with dolly varden, cutthroat trout and all five species of salmon preparing to move up river to spawn. Fly casters can also have success casting to chromed up schooling salmon in the saltwater near kelp beds when the fishing are crashing bait. Note there are early and late season discounts in May and September. Anytime the lodge is open you can expect productive fishing and wildlife viewing. (See WHEN TO GO for more details). Is Baranof Wilderness Lodge Right For You? BWL is the ultimate family adventure with easy fishing and dozens of organized daily excursions and water based activities. It is also by far the best way to experience the incredible scenery and wildlife of Alaska’s Inside Passage. Anglers interested in trophy rainbow trout fishing should look into trips located in southwest Alaska. The lodge offers early and late season discounts in May and September. Additional expenses include, but are not limited, to airfare to Sitka, accommodations and meals in Sitka, hard liquor, fishing licenses, equipment rentals, gift shop purchases, and gratuities. (See RATES for more details). Owner operated by one of the kindest and charismatic couples around, Baranof Wilderness Lodge offers a unique option for visiting southeastern Alaska. Mike and Sally Trotter run an incredibly diverse program exploring the endless coastline of Alaska’s Inside Passage. It is an ideal destination to consider if you are interested in a unique saltwater, freshwater, and land based program with dozens of fishing and non-fishing activities. Instead of the overpriced, overcrowded, and regimented cruise you are considering, take a hard look at BWL. There is no better destination in the world for viewing humpback whales, orcas, dolphins, seals and sea lions, and much more. Bald Eagles, all kinds of other bird life, and of course brown bears as well. Alaska’s Inside Passage is ground zero summer feeding grounds for all these species, and Baranof Wilderness Lodge is ideally located to enjoy the best marine wildlife viewing imaginable. In addition to their spectacular bottom fishing and fly fishing programs, a long list of non-fishing activities welcomes the whole family. Baranof Wilderness Lodge is a true family oriented operation set up to accommodate the youngest of children as well as the older generations. Guests can take hikes, soak in the nearby hot springs, enjoy sea kayaking, clam digging, beach combing, picking the crab pots, exploring waterfalls and rainforest, or simply laying around the lodge. Baranof Wilderness Lodge offers a totally unique option for visiting southeastern Alaska . . . the perfect combination of wildlife viewing and incredible fishing for the whole family. Mike and Sally Trotter (owner/operators) are one of the kindest and most charismatic couples around. They run an incredibly diverse program exploring the endless coastline of Alaska’s Inside Passage. Baranof Wilderness Lodge boasts of a 90% return / repeat booking rate every season . . . perhaps the greatest testimonial you can give a fishing lodge. It is an ideal destination to consider if you are interested in a unique saltwater, freshwater, and land based program with dozens of fishing and non-fishing activities. Southeastern Alaska has much more of a Pacific Northwest type of geography with dramatic, steep mountains, dense spruce forests, waterfalls, and an extremely rugged coastline. The environment is completely different from the rolling tundra and vast ranges of the southwestern half of the 49th State. Baranof Wilderness Lodge sits on Baranof Island immediately opposite the town of Sitka, AK, and is situated a few hundred yards off the Inside Passage in the idyllic Warm Springs Bay. BWL is perfect for families with kids of all ages, couples, as well as the most dedicated anglers looking to fish hard. The amount of marine life literally swimming around the lodge’s private bay is astounding. 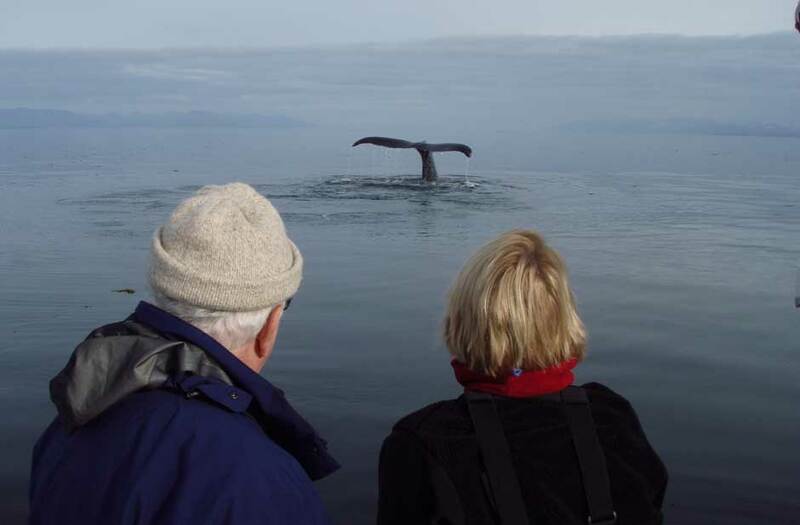 There is no better destination in the world for viewing humpback whales, orcas, dolphins, seals and sea lions, and much more. Bald Eagles, all kinds of other bird life, and of course brown bears are seen daily as well. 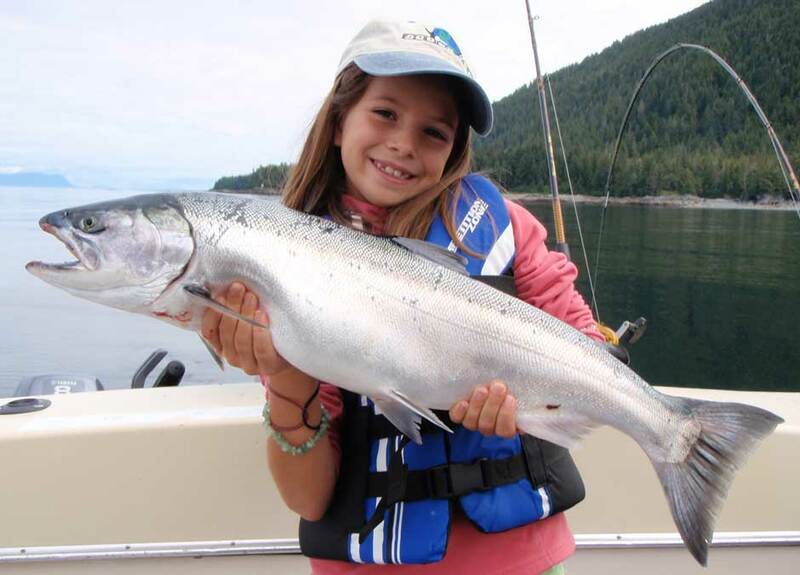 The fun and educational atmosphere at BWL is perfect for the whole family, and you do not have to be remotely interested in fishing to fall in love with Baranof Wilderness Lodge. BWL offers an incredible outdoor and wilderness experience everyone loves. Trouble is, they are almost always booked up months in advance! 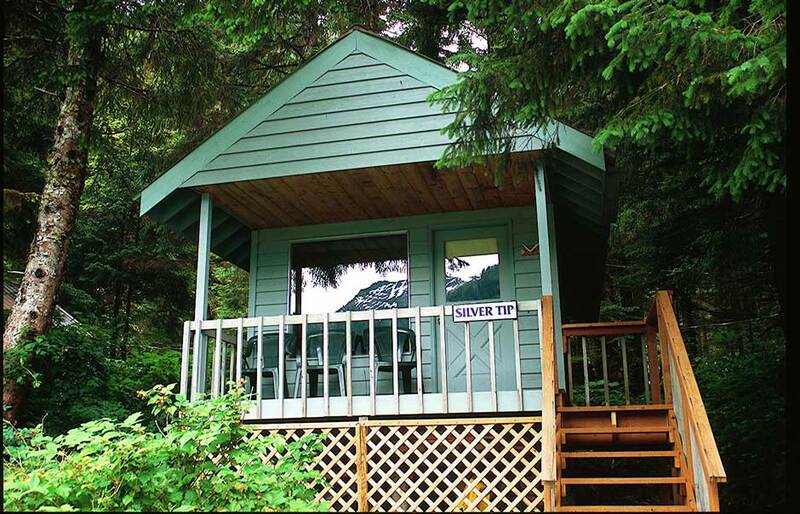 If you want to have a shot at finding space at Baranof Wilderness Lodge, we strongly suggest you call us the summer before and cross your fingers! You may choose your fishing experience each day, from freshwater to saltwater, stream or lake, light tackle spinning, or flies. World-class waters are all a short hike or boat ride from the lodge. Fly fishermen particularly enjoy the freshwater fishing opportunities on small, steep, rivers that dump into the tidal estuary. The pools at the outlets of countless of these little rivers and creeks are loaded with dolly varden, cutthroat trout and all five species of salmon preparing to move up river to spawn. These creeks are of course home to numerous brown bears and sitka deer as well. Fly casters can also enjoy success casting to chromed up schooling salmon in the saltwater near kelp beds when the fishing are crashing bait. The lodge’s program is also heavily geared towards trolling for salmon and dredging for huge halibut and other deepwater species. Encounters with humpback whales, orcas, seals, and dozens of other sea creatures are a part of every fishing day. Alaska’s Inside Passage is ground zero summer feeding grounds for all these species, and Baranof Wilderness Lodge is ideally located to enjoy the best marine wildlife viewing imaginable. Your entire fishing and wildlife viewing schedule is flexible, relaxed, and tailor made by what you want to do! King Salmon (Chinook), Silver Salmon (Coho), Pink Salmon (Humpy), Chum Salmon, Sockeye Salmon, Dolly Varden, Cutthroat Trout, giant Halibut and many varieties of Rockfish and other deepwater species. 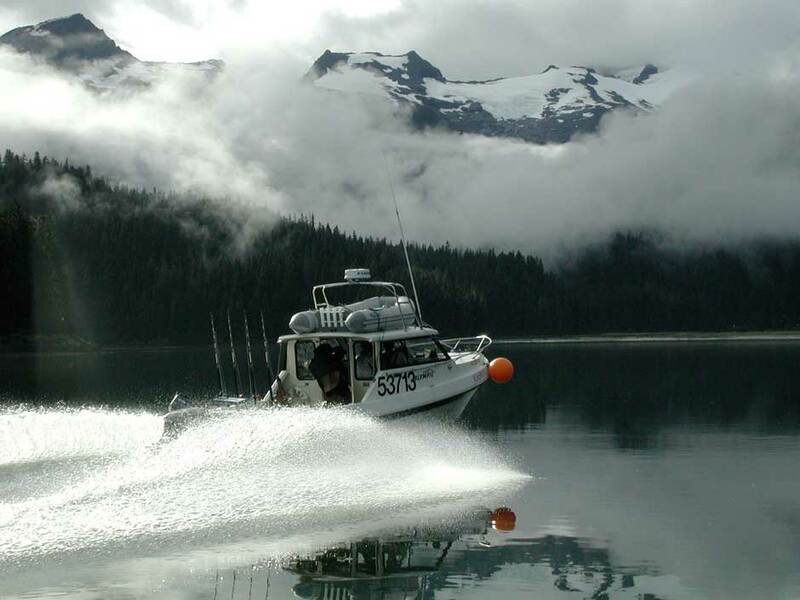 Baranof Wilderness Lodge uses comfortable, safe 24 foot Cuddy Cab cruisers and 16 foot aluminum skiffs. They pride themselves in choosing the most durable marine watercraft available. The fleet is equipped with GPS, sonar, and the latest Raytheon marine radar. All boats are Coast Guard licensed, approved, and equipped with all required safety gear. All saltwater tackle, rods, reels and bait are provided. Freshwater fly and spinning rods are also available with custom flies and tackle that may be purchased in the lodge’s shop. BWL’s truly talented staff of guides have the benefit of many years of experience. They all have an enormous love of fishing and the Alaskan outdoors, but most of all they enjoy sharing the experiences with others. The staff of professional guides are licensed and certified by the U.S. Coast Guard. The lodge sits on a picturesque shoreline inside a protected bay off the Inside Passage. The views of the dense forests, massive waterfall, and dramatic mountains surrounding the lodge are breathtaking. The main building houses the staff and is also the main dining room, bar, and social area. The grounds surrounding the lodge are beautifully landscaped and the deck overlooking the bay is equipped with a hot tub for relaxing with a cocktail while hummingbirds use the feeders. Guests occupy individual double occupancy cabins situated in the dense forest next to the main lodge building. Each cabin is tastefully decorated and is complete with a wood burning stove, floorboard heaters, pine paneling, an armoire, and of course private bath. The entire facility is powered 24 hours by the lodge’s own hydroelectric power plant built on a nearby creek. 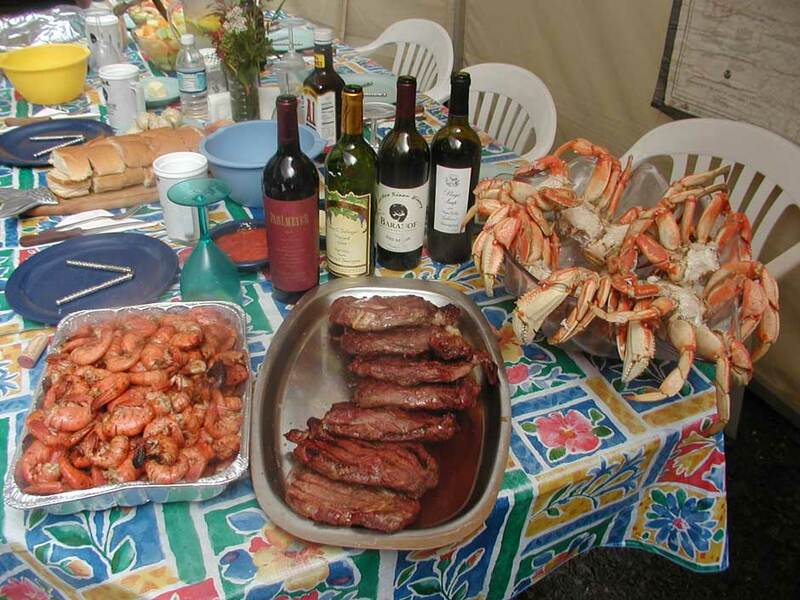 Like all of their boats and equipment, Baranof’s accommodations are immaculately maintained and fresh. Guests can also choose to indulge in a soak in one of the Warm Springs Bay natural hot springs, or enjoy a proper massage in the “Mermaid Spa” building. The food and drink at the lodge is nothing short of spectacular. Fresh seafood is a part of almost every meal, with the menu inspired by the local halibut, salmon, crab, shrimp, and clams. The fresh breads, garden grown vegetables, desserts, and appetizers prepared by the chef are incredible. Meals are served family style in the main dining room and are complimented by a nice bottle from the wine cellar. BWL’s staff of guides, cooks, maids, and support crew are always working hard with a huge smile and wonderful attitude. It is hard to put into words how much they love the job . . . and it shows. Everyone working at BWL is well polished, professional and always on point to ensure your experience meets the highest of expectations. Guests of Baranof Wilderness Lodge travel to Sitka, Alaska on Sunday en route to the lodge. Sitka is easily reached with several daily flights from Seattle on Alaska Airlines or Delta. Guests must spend the night in Sitka before a Monday morning float plane transfer to the lodge. Most guests stay at the Sitka Hotel. BWL operates on a Monday – Saturday (5 night / 5.5 day fishing package). Travel from your home to Sitka, Alaska (SIT) via Seattle. Overnight at the Sitka Hotel. 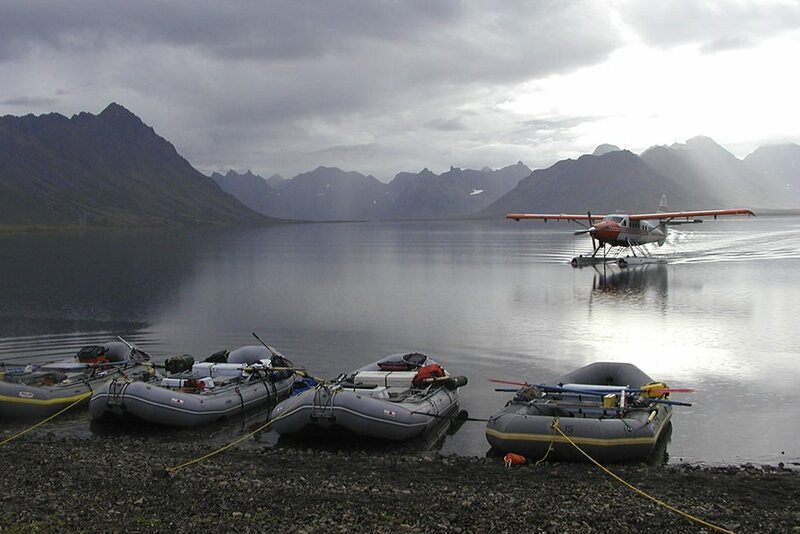 Early in the morning, return to the airport and board a float plane for the forty-five minute flight over Baranof Island to Warm Springs Bay – directly to the lodge’s dock. Following lunch and getting organized, head out for an afternoon of fishing. Four full days of guided fishing, adventure, and wildlife viewing at Baranof Wilderness Lodge! Transfer back to Sitka via float plane in time to make commercial connection home. 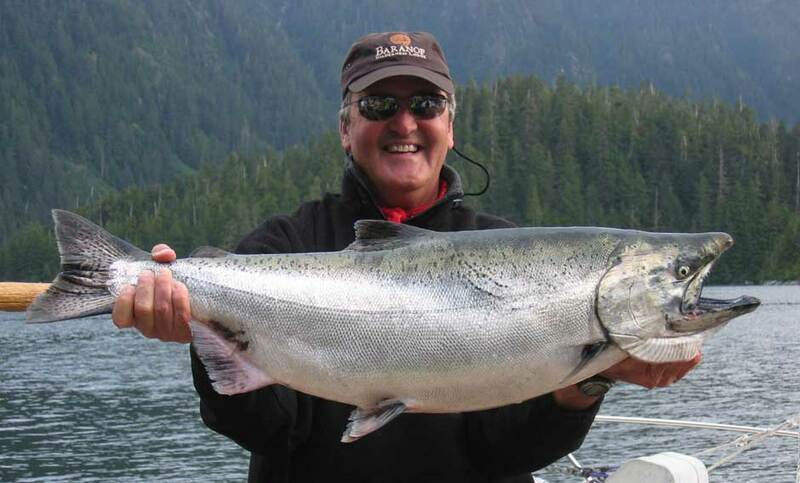 Note that the lodge offers early season discounts during the prime King Salmon runs in May as well as late season discounts during the Silver Salmon run in September. Our Pre-trip Outfitting Guide provides detailed information about how to pack and prepare for the trip to Baranof. Picking a time to visit Baranof Wilderness Lodge is easy as the lodge offers a complete program the entire season, with the exception of the King run occurring early season and Coho run late season. Unless you desire to target a specific species of salmon, don’t put too much stock into trying to pick “the best” time to visit. May and September weather is quite cooler than the longest days of the season in July, however any weather pattern can occur any time during the season. There is perhaps no other destination in Alaska or perhaps anywhere on earth where so many non-angling activities are offered and organized. Baranof Wilderness Lodge is a true family oriented operation, offering dozens of professionally guided tours, excursions, and activities. BWL is set up to accommodate the youngest of children as well as the older generations of folks interested in witnessing this incredible wilderness. The Inside Passage of Southeastern Alaska is home to a vast array of marine wildlife found nowhere else. Humpback whales, killer whales, dolphins, sea lions, Dalls Porpoise, bald eagles, brown bears, Sitka Deer and harbor seals are truly a part of the daily routine. Guests can take hikes, soak in the nearby hot springs, enjoy sea kayaking, clam digging, beach combing, picking the crab pots, exploring waterfalls and the rainforest, or simply laying around the lodge. Their program is set up to accommodate everyone of all interests with total flexibility. *Make sure to inquire about the set dates for one of the lodge’s Naturalist Intensive Weeks. 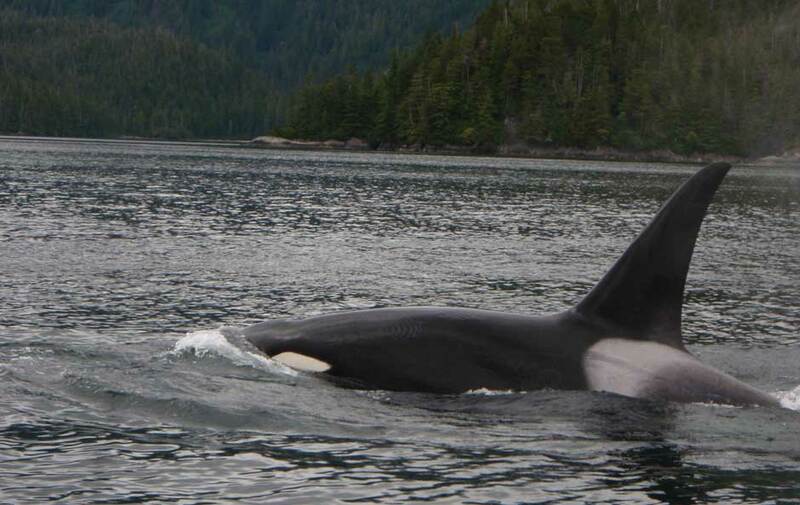 Cruise to Yasha Island Take a cruise across Chatham Strait where you can view whales such as humpbacks, orcas, and Dalls Porpoise. Observe harbor seals or stellar sea lions in their natural habitat – a rookery of over 200 animals! Walk though the plush ferns and hemlocks on a boardwalk trail to Baranof Lake where you can view endless cascading waterfalls and pick fresh mountain berries. If you prefer a more intensive hike, try the hike to Sadie Lake where you’ll pass ponds full of lilly pads and families of Red-Throated Loons. Whether you are a beginner or an expert, you can be on your way to one of the most unique tide pools in the Pacific Northwest, via one of the lodge’s sea kayaks. Tide pools are the jewelry boxes of the sea, decorated with brightly colored sea stars, hermit crabs, sea anemones, and treasures of all sorts waiting to be discovered. Explore the pristine ancient rain forest environment bursting with old growth life as centuries of moss cushion your every step. Experience walking in protected woodlands where few human steps have ever been made. Brown bears flourish on the salmon charging the streams to begin their spawn. 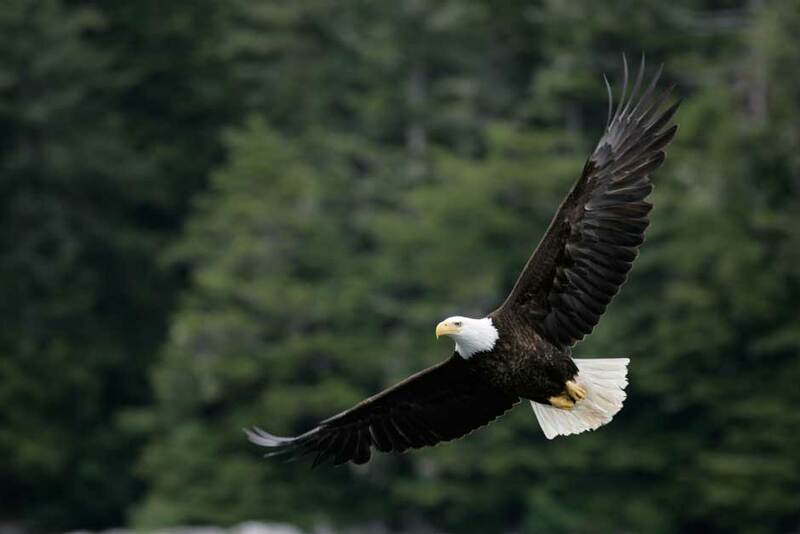 Bald eagles soar above as you witness the powerful mammals, birds, and fish that make the food chain come alive. Accommodations at the Lodge as specified; Round-trip float plane transportation between Sitka and Baranof; Guided fishing with boats and professional guide service with all top quality salt water equipment; Gourmet meals and an impressive wine list & beer; Applicable municipal rents and user fees. Commercial airfare to Sitka, AK; Overnight accommodations and meals in Sitka the Sunday night prior to transfer to the lodge; Gratuities for Guides and Lodge Staff; Fishing Licenses; Use of Fly-Fishing equipment & flies (we recommend you bring your own); Hard Liquor and Gift Shop purchases, and Sales Taxes. Tailwaters Travel must adhere to the cancellation policies of the guides and lodges which it represents. Baranof Wilderness Lodge’s policy follows: A non-refundable deposit of 50% per person is required to hold both space and guides on all packages. No space or guides will be held without receipt of deposit. Full pre-payment is due 90 days prior to arrival. Refunds of deposits/payments made on credit cards will be charged a 3.5% service charge to fully compensate Tailwaters Travel for all bank charges incurred. Receipt of deposit and/or final payment is acknowledgement that registrant has read and accepts the cancellation, refund and responsibility clauses.